I finally got around to reading this book Kathy gave me for Christmas. It was funny and cute, if predictable. But it was the '80s so what do you really expect. I love the idea of the boys wearing skirts to protest the student dress code, though. It started slower than I remembered, even though the skirts ARE mentioned almost immediately. I guess, not being a fourteen year old boy, I don't totally appreciate Chipirito Jalapeno Flavor Tortilla Chip salutes, and I could have stood WAY less time on Schwarzkopf's nominations for Obnoxious Jerks official products.All that said, once it gets going, the book was every bit as good as I remembered. And I enjoyed some of the official products' responses to their new status. I especially liked the dating advice Frank had to get long distance from an old friend. Spot on.And, although most schools are now air conditioned, and dress codes a little more tolerant, the gender issues have not changed nearly as much as we might like to think since 1988.Fun reading. The Obnoxious Jerks are a group of guys protesting against the stupidity of cliques and her mentality. But they also challenge the rules of the administration, which gets them into trouble frequently. Back is the most recent addition to the group and he is still trying to figure out the rules, but he thinks Leslie Freeze might be a great new member (even though she's a girl). But Joe has a history with Leslie that no one wants to talk about. When they decide to wear skirts to protest the dress code, who else can they turn to for help? I bought this book at one of the book selling things in my small little middle school-you know, where scholastic or whatever comes in and sells all kinds of books. I've had this book forever, and it was the first book that ever made me laugh out loud while I was reading it, and it still does every time I read it. It's about a student who moves around a lot with his family, and has a hard time making a lot of friends because he (and the few friends he does make) are generally smarter than most of the administration and are smarter than almost all of their classmates. It's a great book about smart-aleck students trying to change some of the dumber things about high school. 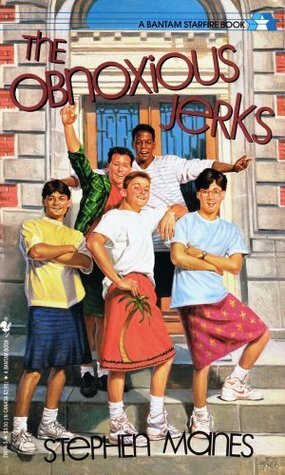 This book makes fun of the standard cliques in high schools: the jocks, student government, and those that just go along with the status quo. I like to think of this as a Tice kid classic, meaning it was read by more than one of the kids and just passed on down the line. I have a stack of these books in my possession. Just can't bare to give them away because of the memories they hold for me. This particular book I read only when I couldn't find anything handy to read. I had avoided it because the picture on the cover had the teenage guys wearing skirts. I suppose I was wary of it. I did, however, enjoy the book when I read it. Probably find it quite pointless now, but it was good for a few laughs then. Read this when I was a kid, saw it at the library book sale a year or so ago, and bought it to read again since I remembered nothing about it but the cover and title. The guys ARE obnoxious and can be jerks, but they're really just a bunch of smart, bored kids who don't really fit in anywhere else so create their own clique. Leslie was an ace character. And I actually wouldn't have minded more romance in this one. I don't know what brought this book to mind, but I loved it when I was in junior high. It didn't matter that I wasn't a teenage boy, or that my school had air conditioning and not so strict of a dress code. It didn't even matter that I was a well-behaved student who never got in trouble for anything. This book still resonated with me. Someday, I want to track it down and read it again. Quite funny. Slightly stupid...definitely ridiculous. But funny.I didn't even realize it was from the eighties until I was almost done with it. You really can't tell. This book could be read by any kid, now or then or anytime in between, and still be great. Okay, this was pretty funny. I loved this book as a kid and I still quote some of the lines from it. I always wanted it to be more popular so that other people would know what I was talking about. Would be cute/funny if I didn't work with kids everyday. I YA book, that I couldn't finish, although the premise is cute.